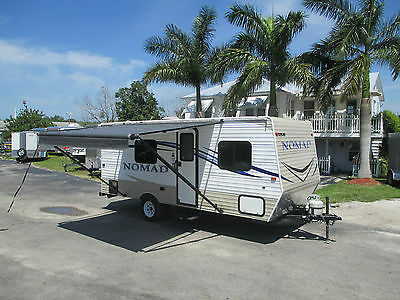 2014 Used Travel Trailer Skyline Nomad Retro 183B - GREAT CONDITION!! 2014 NOMAD RETRO 186 by SKYLINE FRONT DOUBLE BEDDINETTE and KITCHENREAR BATHSLEEPS 3STOVE TOP BURNERKITCHEN SINKWARDROBETV HOOK-UP/PARK CABLELAMINATE COUNTERTOPSFLAT PANEL CABINET DOORSMINI-BLINDS3 CUBIC FT. DOMETIC REFRIGERATORTWO-BURNER WEDGEWOOD RANGE TOPDOMETIC MICROWAVE OVENACRYLIC KITCHEN SINK w/ FAUCETABS TUBTHETFORD TOILETPOWER VENT FAN in BATH12V WATER PUMP16000 BTU FURNACEA/C35 AMP 12V POWER CONVERTER6 GAL. GAS WATER HEATERBATTERYAMPLE OUTSIDE STORAGEMOUNTED ENTRY STEPELECTRIC BRAKESRADIAL TIRES 205/75R14 SAFETY CHAINS and BREAKAWAY SAFETY SWITCH4- STABILIZER JACKSSIDEWINDER TONGUE JACK w/ FOOTSEAMLESS ALUMINUM ROOF10' AWNINGPATIO LIGHTRADIUS ENTRY DOOR w/ SCREEN20 LB. PROPANE TANKPROPANE LEAK DETECTORS, SMOKE DETECTOR, CARBON MONOXIDE ALARM, FIRE EXTINGUISHER SWAY CONTROL & BALLMOUNT ALSO INCLUDED PAYMENT TYPES: Cash for in person transactions is accepted. We also accept direct bank wires. Final bid is a cash/wire price. If you want to pay credit card when you pick up we can accomodate you for a 3% processing fee. 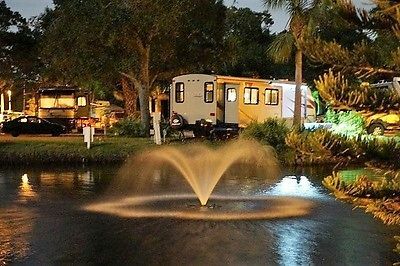 Trailer is located in Palmetto, FL, buyer is responsible for shipping.We are a dealer so we will charge sales tax to Florida buyers and also tag & title fee. NON-REFUNDABLE DEPOSIT of $500 via Paypal within 3 days after close of auction. The balance upon pick up.Thank you for checking out our auction! Please call with any questions you have before you bid. 941-723-3339 Thor Trailers.Sale is final if you win the auction.Thor Trailers is a family owned and operated business with over 50 years of combined experience. We strive to make your purchase an experience that you will truly enjoy. We specialize in customer service. Your satisfaction is our #1 goal!! This is a very nice Travel Trailer that was only used a couple times to sleep in but has never had the restroom used. It is fully self contained with holding tanks and 2 propane tanks for the hot water heater. It has a roof A/C unit and central heat. It has fridge, micro wave, shower, head, custom awning that attaches like a tent to keep mosquitoes away, lots of storage inside and out, tires like new, no leaks in roof, no rust. 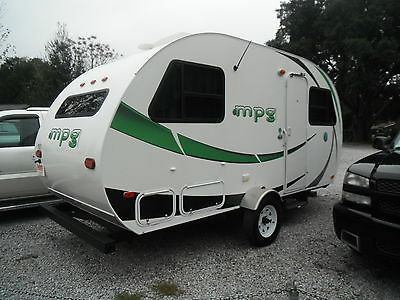 This is an all fiberglass trailer and if you know anything about MPG's than you know how well they are built. It also has a power slide in the living area with couch, table for eating, queen size bed in bedroom, 19" LCD TV, Stereo system with CD player, and sleeping for 4. This is a 4 person RV and its ready for camping. It has no funky smells, looks new still with no soft spots or damage. Call Mike @ show contact info or come by Wards Motorsports 11130 Lillian Hwy Pensacola FL 32506 Mon-Fri 9-5:30. We do require an immediate deposit of $500 and remainder balance due within 5 days. If you need more time to ship it just let us know and we will try to work with you. There will also be a $199 dealer fee added to all auctions including dealers who buy from us due to high Ebay fees. We must also add any taxes and dag fees by FL laws.